There is a pattern that is apparent across the skin care industry when it comes to anti-aging—it's the focus on protectind healing only facial skin. While it's no mystery why so much of skin care is focused on fighting facial wrinkles and fine lines, the rest of your body ages at the same rate but only receives a fraction of the care, if any. Full body anti-aging skin care is a trend that addresses this imbalance and provides the opportunity to focus on specific areas of the body with precise measure and care. With age, the body begins to slowly lose collagen and elastin, the essential building blocks of skin. After the age of 25, the body loses roughly 1% of its collagen each year which, along with environmental factors, can eventually result in sagging skin, wrinkles, cellulite and pigmentation. The solution to these seemingly unavoidable problems is to treat the body with as much specified and deliberate care as the face. The upper arms, neck, décolleté, abdomen, buttocks and hands all require equal care to fight the compounding effects of aging and retain the youthful glow and firm feel of your skin. Providing specific areas of the body with individualized treatment doesn't necessarily require the client to memorize an over-complicated routine or purchase a skin care products for each and every unique area their skin covers. Since the skin covering a majority of the body functions the same, the focus should be on identifying which areas need the most attention, and which treatments will deliver the best results. Key target areas on the body include the following. Upper Arms. Muscular breakdown and sun damage can cause skin to sag and triceps to "wave." Neck. With age, fat is lost from the neck, which can cause sagging and wrinkles. Décolleté. A number of factors including gravity and sun damage cause pigmentation and wrinkling in this area. Abdomen. Diet, exercise, and genetics can cause cellulite and other skin conditions on your abdomen. Hands. Constant exposure to environmental factors along with frequent hand washing can cause irritation and dryness. Buttocks. Reduction in muscle mass and fat can cause wrinkling and drooping skin. Luckily, the treatment for common skin problems is largely the same for all of these target areas. The process that consistently proves most successful can be boiled down to three primary steps. Exfoliation. The first step to eliminating these issues on any part of the body is a term heard frequently in skin care-exfoliation. Skin comes into contact with so many harmful factors every day, which can build up and become extremely detrimental. Exfoliation removes this environmental debris and dead skin and provides the client with a clean slate with which they can begin the healing process. Cleansing and lightening. The second step to comprehensive full body skin care is the cleansing and lightening process. Applying products with ingredients that aid in cell repair, hydration, lipolysis and dermal relaxation onto freshly exfoliated skin will do wonders for not only preventing further dermal degeneration, but also actively repairing any damage that has already taken place. Hydration. The third and final step is the simple but vitally important act of hydration. Skin's natural reparative and regenerative processes rely heavily on proper hydration in order to function at peak efficiency, which means completing a full body skin care routine with proper hydration. This leaves skin in top shape to actively fight off signs of aging. This final step will also leave skin feeling smooth and healthy for days. Providing specific areas of the body with individu­alized treatment doesn't necessarily require the client to memorize an over-complicated routine or purchase a skin care products for each and every unique area their skin covers. Papyrus Plant Stem Cells. These plant stem cells aid in skin's hydration balance causing enhanced softness, suppleness and regeneration. This is achieved through the strengthening of the skin's natural barrier function, which limits epidermal water loss by catalyzing corneocyte cohesion in the stratum corneum. Refined Coconut. Coconut extracts are truly multifaceted when it comes to skin care as they are beneficial for retaining moisture, smoothing skin, minimizing pores and evening skin tone. Coconut contains antimicrobial, anti-fungal and immune boosting properties as well as providing natural protection from the sun's harmful radiation. Suma Root. This incredible Brazilian root encourages healthy blood circulation that is vital for balanced, even-toned skin. In addition, it also strengthens the immune system and protects the skin from environmental damage, giving skin the perfect stress-free environment to quickly heal and perform its vital functions more efficiently. Silk Extract. Silk contains 18 natural amino acids, which work to promote skin’s elasticity and fight signs of aging. Its moisture balancing properties give a boost of hydration to skin, leaving it with a luxurious finish one could only describe as "silky." Hemp Oil . Cannabis sativa seed oil actively combats skin irritation and its essential fatty acids, Omega 3 and 6 bring luminous shine to skin and hair alike. Hemp oil also balances the activity of the sebaceous gland. Shea Butter. This soothing ingredient aides dry, dehydrated or chapped skin by providing the same moisture makeup as is produced in our skin’s sebaceous gland. It also contains natural vitamins A, E and F to repair and restore skin. The recently launched Lira Spa line from Lira Clinical caters specifically to full body skin care needs and purposely addresses all of the common problems that facial skin care products don't expressly treat. 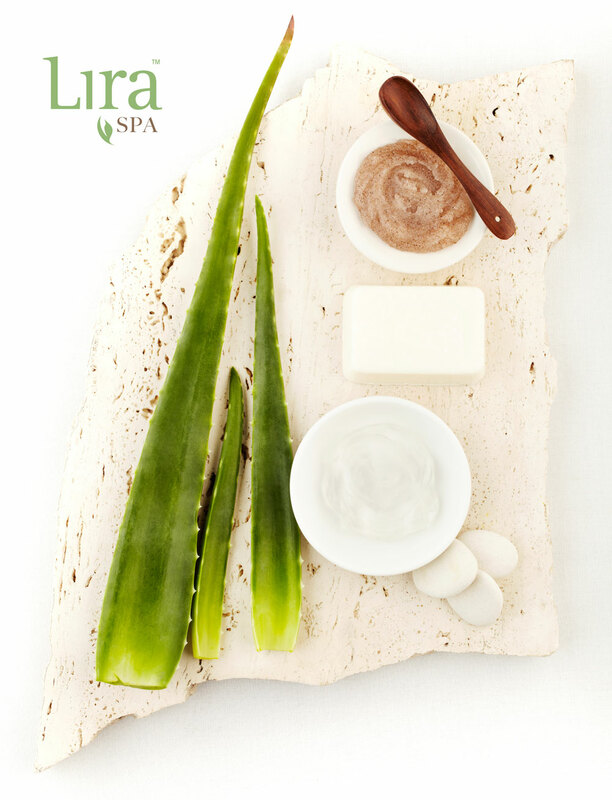 The Lira Clinical Spa line covers all of the necessary steps to achieve complete skin health from head to toe through the utilization of natural and effective ingredients (including those mentioned above) that will leave skin smooth, vibrant and, above all, healthy. The first product included in Lira Clinical's Spa line is the Body Smoothing Scrub with PSC which utilizes refined coconut, hemp oil and papyrus plant stem cells as a body exfoliator that effectively smoothes and hydrates rough skin. After the skin has been exfoliated, one would then prepare the skin for further treatment while evening skin tone with the Body Brightening Cleanser with PSC. This unique body cleanser lightens and hydrates skin with lactic acid while simultaneously soothing problem areas with aloe vera extract. Next, one would address targeted areas with the incredibly effective Body Firming Lotion with PSC. This stimulating lotion harnesses the power of coconut oil, suma root extract, papyrus plant stem cell extract, as well as an array of beneficial polypeptides to reduce the appearance of cellulite through microcirculation and lipolysis while simultaneously hydrating skin. Once the targeted areas have been addressed, it's time to treat skin with the Body Silk Soufflé with PSC , which will give it a luxuriously smooth finish when massaged into skin. Finally, as the extra special touch to round out the lavish full body skin care experience, one would apply the Body Nourishing Oil with PSC. This body beauty oil will balance the hydration of trouble areas including hands, feet and joints for the ultimate finish. Total skin care is vital for combating the effects of aging on all fronts. To learn more about the Lira Spa Line, please contact Lira Clinical at info@liraclinical.com or 877-440-5472.